Upon turning 23, I have suddenly become very aware of my age and the fact that my skin has started to show it a bit. I have always struggled some with acne and oily skin but overall, my skin hasn't given me too many problems. Recently, it is extra oily and I am breaking out (likely due to stress). I made a resolution to update my beauty regimen in 2017- time to graduate from whatever random drugstore brand I used to grab while grocery shopping and get products that are really best for my skin. All my life, I have just used drugstore/supermarket brand products. I always thought they worked fine and got the job done. I never put a lot of care into it, I just grabbed whatever I needed and went on my merry way. I usually just used a cleanser and a light moisturizer whenever I actually remembered to apply it. I used to forget to take off my makeup before bed.... I did not take very good care of my skin and it was starting to show. As I have gotten older, I have begun to realize just how much the quality you pay for matters. I decided it was time to get some "grown up" skin care products and start really taking care of my skin so that I don't look awful when I am older. I only have this one face so I better keep it looking good! I did a ton of research and I got all new products during the last week of December 2016 so I have been on this regimen for about 2 months. I have noticed such a HUGE difference in my skin. Way less breakouts and significantly less oily. It looks brighter, it's softer and I just feel better about my skin. 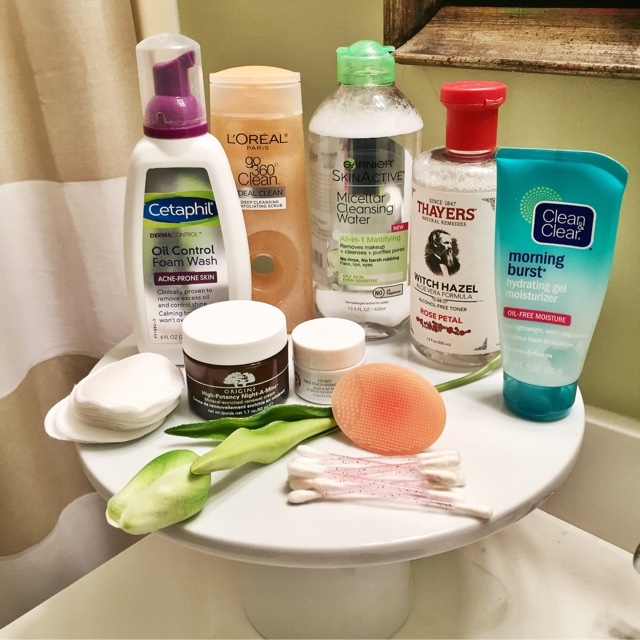 When researching best cleansers for oily skin, this popped up on nearly every list. Though this is still essentially a drug store cleanser, it is so darn good I refuse to get anything else. It is a light foam with no smell and it cleans/mattifies without drying out my skin. I use this morning and night. Once again, this is drug store but it is a great exfoliator to use a few times a week. It is not harsh but it does the job. Also, the scrublet comes with it and I LOVE the scrublet. Witch Hazel has been around for a long long time but I had no idea it was such a great toner. I use this morning and night after cleansing and it leaves my skin feeling clean and tightened without drying my skin out like so many toners have in the past. I like the Thayers because it smells great in the Rose Petal version. Gel moisturizers are supposed to be better for oily skin under makeup. This little gel has been great through the winter- it keeps my skin hydrated and provides a great base for makeup. It is another drugstore brand but it really works great. And we have arrived at my big splurge. This night cream is ah-mazing. Worth every penny. It leaves great moisture with little to now oily or gummy residue. It smells fantastic and a little goes a long way. Night cream is something I think it very important and I have noticed a huge difference in my skin since using this every night before bed. This is a great little eye cream. I have noticed my dark circles are not as bad since using and I am hoping it is helping to stem the formation of any wrinkles. I try to use this once a week after my husband goes to bed. Just apply, find a Netflix show and drink a glass of wine before washing off. I love the mud masks because they just feel cool when applying and make for the cutest snapchats. This purifies and detoxes your skin to help brighten it. I have been very happy! I LOVE micellar water. It is so quick and easy to get your makeup off without the oily residue of most makeup removers. I have become super diligent about taking off my makeup before bed and this makes it so easy. Also, this has mattifying properties to help keep the oil down on my face. 1. Use Micellar water on a cotton round to remove all makeup. So that's what I am using/doing! It has been working great. Any other suggestions for oily skin?? ?